This sounds good, but I dont see anything in your post about why you posted on these forums? Whats next? Are you planning to release this as open source? Are you going to make a component for it? Are you just sharing that you made something? I would love to see something like this made open source, as there are always questions on these forums from people looking for something similar, if not exactly, to what you created. This sounds good, but I dont see anything in your post about why you posted on these forums? A: I only wrote the client side sync engine using Xamarin Platform, People on this forum may find it useful as the it's very difficult to develop a sync engine at database level. Whats next? Are you planning to release this as open source? Are you just sharing that you made something? I would love to see something like this made open source, as there are always questions on these forums from people looking for something similar, if not exactly, to what you created. A: I was thinking of Open Source, but i am not prepared to do in the next 12 months. I happy to give some tips if any people has similar problems. Are you going to make a component for it? A: No in short. Sync engine requires lots of server side setup and best practice needs to be followed, just like the "Sql server merge replication". Not all existing databases are ready for mobile database replication. it usually requires minor modification & optimisations. Thanks for clarifying a little. I see you mentioned that people on this forum may find it useful. How can someone get access to what you made? Do you want us to email you or something? I was hoping for some info on how to get what you made. Surely, I can be reached on [email protected], if you found any thread regards to this topic, i can be notified to give some comments on the problems & solutions. After that, i am not too sure. If anyone is really interested, I may open source the client app (my version of Xamarin sample Field Service), and setup the testing server for people to play with it. BTW, one thing i was very crazy, i really hate the storyboard as the underlying file changes significantly even if you only made a tiny change on the designer. So I rewrote the UI using code ONLY. 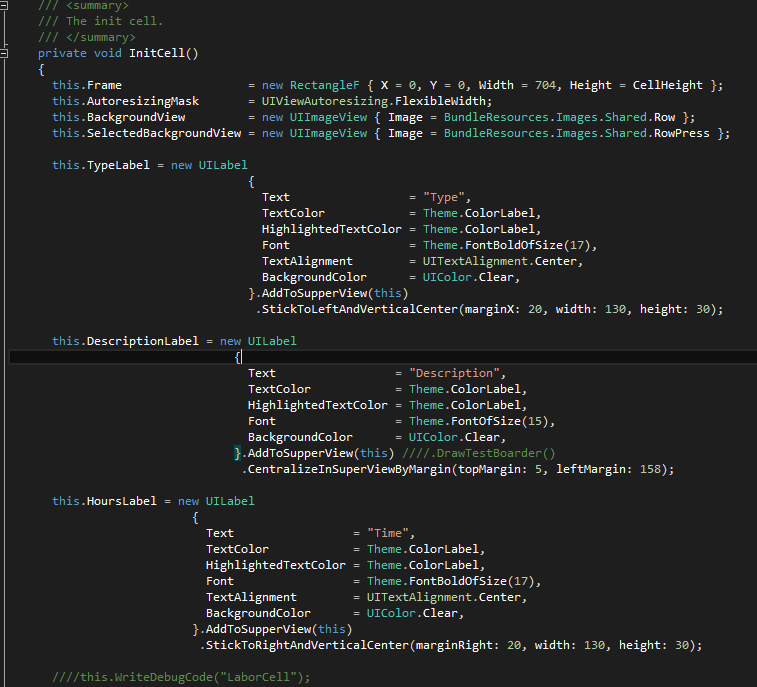 Some code which builds the UI. +1 for 100% coded UI! I'm looking to use Xamarin for a mobile app that users will have to collect data whilst offline and then sync it back to the server. So far what you have created seems like the best way for the users to do this sync. Is there any chance that I can see what you have done ? I am planning to publish a sample app and a sample backend on amazon service, but it will take some time. Please send me your contact details to [email protected], i can do a demo to check whether this is what you are looking for. The Microsoft Sync Framework is another solution that provides cross-platform data synchronization. Before I rolled up my sleeve, I did the look at the sync framework and its open source toolkit. Here are the reasons I did not end up using it. 1) Row Filter support is buggy, if you have row updated which cause that row is no longer satisfying the filter, the row won't be deleted from device, it row will be kept on device forever. 2) it requires lots of coding for large application as i got more than 80 tables need to be replicated to device. 3) Microsoft stopped working on "Sync Framework" long long time ago. Zumero has this functionality at no to very low costs. Hi KJH, are you opensourcing your solution as it sounds very interesting. Any links to the source so we can have a play? Thanks in advance. A version opensource and support them to continue developing and improving. lots of people sent me emails regards to this sync engine, they would like to gets the bits and have a play. unfortunately, I have been extremely busy involving a start up project which heavily depends on this sync engine. this project may last a couple months. I would revisit this around mid of 2014. Have you share it somewhere or can you share it in his actual state? Is there an other existing solution to do this stuff? Great concept, any update on making this available to others? KJH - I am also very interested in this project. I think that a lot of people would benefit from this, and if you open source it, even at its incomplete state, a lot of progress will be made to take it to the next level. We're all hoping to hear some good news about this project soon! An old thread, but I would be interested in this. There is a software available at "www.mobiledatabasesync.com" which has web based management console for publishing and synchronizing data between sqlite and sql server. when you download software, it gives you dll file which you can attach in your xamarin code and call a simple function. However this product is only built for Android platform and quite easy to use.